The apple harvest is in. Do you know what it takes to be an apple picker? NPR posted this five-minute story in 2015. Do you have a story? Please share! This entry was posted in Apples and Other Fruit, Jobs/Employment/Volunteer Opportunities on November 8, 2018 by Michelle Miller. Register now for the 4th Annual 2017 Great Lakes Great Apple Crunch! Are you looking for an easy way to celebrate Farm to School Month, support your local farmers, and have a good reason to party?! 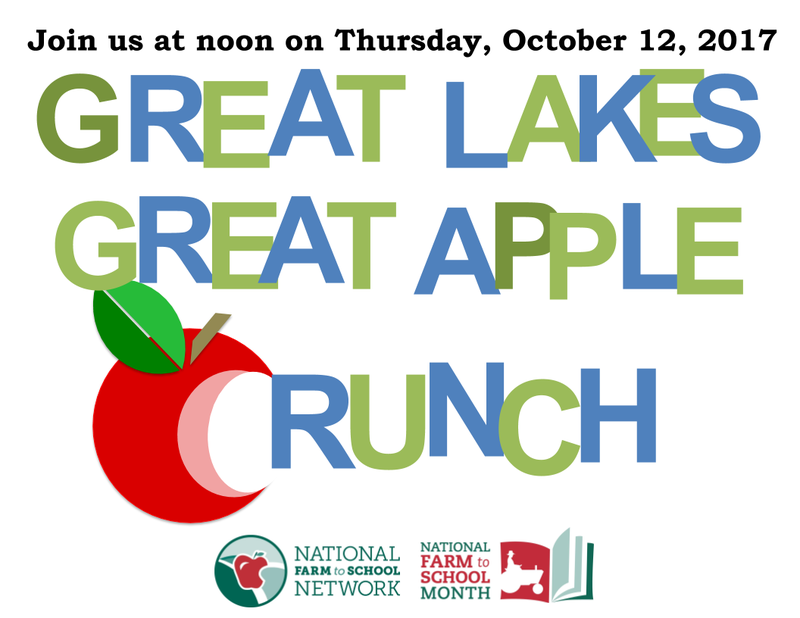 Look no further than the Great Lakes Great Apple Crunch on Thursday, October 12. This fun, easy, and flexible event encourages you to purchase local apples and ‘Crunch’ into them at the same time with over one million other Crunchers across the region. We already have 250,000 Crunch ers registered at over 700 different sites in Wisconsin, and we hope that you will join us! Register today to help us keep track of our #OneMillionCrunch goal. When you register you get a copy of the Crunch Guide to help you source local apples and plan your event, and you can get FREE CRUNCH STICKERS (sticker deadline October 2)! Everyone at K-12 schools, early care centers, farms, hospitals, agencies, offices, non-profits and more is encouraged to participate. Find more information and registration at the links below, or contact Vanessa Herald (vherald@wisc.edu) with any questions. This entry was posted in Apples and Other Fruit, Marketing & Communication - The Driftless Identity, Uncategorized, Upcoming Events on October 2, 2017 by Michelle Miller. AppleTalk: Where Apple Growers Share IPM Ideas Now is the time to register for AppleTalk. We have scheduled a special AppleTalk call with Amaya Atucha, University of Wisconsin Horticulture, to discuss tree phenology and winter injury, breaking dormancy, and nutrition needs for trees. We will also discuss green tip disease management on this call. Unlike our regular Tuesday calls, this call will be on Friday, March 31, to align with Amaya’s availability. The regular AppleTalk season will begin sometime in late April on our regular Tuesday schedule. 18 conference calls to accommodate a longer season. AppleTalk podcast. We need your help on this one. The available conference-call services offer either a stream that requires a flash player (not smart phone compatible) or generates a large media file which has to be downloaded. Both of these options are not friendly for smart phones. We are investigating low-cost opportunities that could allow us to take the downloaded file and turn it into a podcast that could be streamed or downloaded. This is not our area of expertise and if you know of a good program or have some ideas, let us know! This seems to be an area where the conference-call technology has not caught up with the times. 2017 fees are set at $150. When AppleTalk began in 2006 it was sustained through several major grants from the US EPA and USDA. Sacia Orchards helped us meet our budget for the last two seasons. Please thank them if you see them. We anticipate this modest increase and the online registration will secure the budget we need to keep improving the quality of AppleTalk and the content we deliver to you. This business expense pays for itself many times over – invest in your management. Please let us know if you have any questions, comments or concerns. We would love to hear from you. Please contact Peter Werts, pwerts@ipminstitute.org, (608) 232-1410 x1002 or Thomas Bernard, tbernard@ipminstitute.org. This entry was posted in Apples and Other Fruit, Technical Assistance/Funding, Uncategorized, Upcoming Events on March 28, 2017 by Michelle Miller. This workshop will add to your existing knowledge of pest management for grapes and add to your repertoire of knowledge about spotted wing drosopliha and how to calibrate your sprayers. This unique, innovative program provides an intensive, full-day applied workshop including hands-on demonstrations as well as team scouting opportunities. Registration for the workshop is limited to 40 participants on a first come, first served basis. This class size allows for active discussion and interaction with course instructors. Registration fees cover course materials, refreshments and lunch. Field guides will be available for purchase during the workshop. This workshop is a collaborative effort between the UW-Madison Center for Integrated Agricultural Systems and UW-Extension. Registration questions? Contact Regina Hirsch at 608-335-7755 or rmhirsch@wisc.edu. This entry was posted in Apples and Other Fruit, Upcoming Events on July 3, 2014 by Michelle Miller. Enjoy your favorite apple products, this year of plenty! Growers are meeting here in Madison on December 9th to talk about their efforts this growing season and their concerns for the next. If you are a commercial apple grower and want to join us, contact us! Apple growers from Wisconsin and Minnesota share their thoughts on running a farm-based business, the pleasures of apple growing, opportunities for learning and assistance, and what the future holds. This entry was posted in Apples and Other Fruit, Uncategorized, Upcoming Events on November 6, 2013 by Michelle Miller.